During the formal dedication and ribbon cutting of the LBJ Museum’s second floor, Dr. Ed Mihalkanin, President of the LBJ Museum of San Marcos, thanked the Hays County and City of San Marcos governments for their donations to the Museum which made possible the renovation of the curation and archive rooms on the first floor and the renovation of the second floor. Many Hays County residents are unaware that the Museum building is actually owned by Hays County and the Museum has had a long term lease on the building since it opened in 1998. Dr. Mihalkanin expressed the Board’s appreciation for the cooperative atmosphere it has received from both the County and the City without regard to the changes of membership on the Hays County Commissioner’s Court or the San Marcos City Council. He said the Museum has maintained excellent relations with both local governments. Dr. Mihalkanin introduced the Museum’s current board members that were present for the Ribbon Cutting: Carmen Imel, John McCrocklin, Scott Gregson, Pat Murdock, and Ted Breihan. Bill Cunningham the Museum’s operation manager was also present for the dedication. Dr. Mihalkanin also acknowledged the assistance of Teresa Schwartz, a past board member, in hosting the event. 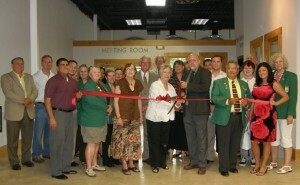 In addition to the San Marcos Chamber of Commerce’s Ambassadors several local government officials were present for the ribbon cutting including: San Marcos Mayor Daniel Guerrero, Council Members Kim Porterfield, Jude Prather, Shane Scott, Ryan Thomason, John Thomaides, City Manager Jim Nuse, Melissa Millecam, Main Street Director Kelly Franks, Colette Jameson, and Hays County Commissioner Precinct 4 Ray Whisenant. Dr. Mihalkanin went on to thank the Museum’s two previous presidents, Nora Linares-Moeller and Pat Murdock, for all of the work and dedication that they have showed to the museum. The Museum is having a fun fundraiser next month – 60’s Night. 60’s Night will be Friday, August 3, from 7 to 9:30 pm. Tickets are on sale now at the Museum.